Not to be confused with Cigarettes & Coffee, a 1993 short film written and directed by Paul Thomas Anderson. For the Jimmy Eat World song, see Coffee and Cigarettes (song). 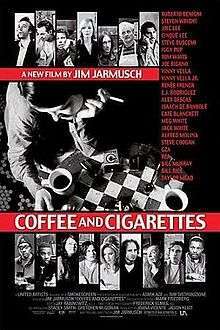 Coffee and Cigarettes is the title of three short films and a 2003 anthology film by independent film director Jim Jarmusch. The film consists of 11 short stories which share coffee and cigarettes as a common thread, and includes the earlier three short films. The film is composed of a comic series of short vignettes shot in black and white built on one another to create a cumulative effect, as the characters discuss things such as caffeine popsicles, Paris in the 1920s, and the use of nicotine as an insecticide – all while sitting around drinking coffee and smoking cigarettes. The theme of the film is absorption in the obsessions, joys, and addictions of life, and there are many common threads between vignettes, such as the Tesla coil, medical knowledge, the suggestion that coffee and cigarettes don't make for a healthy meal (generally lunch), cousins, The Lees (Cinqué and Joie, and a mention of Spike Lee), delirium, miscommunication, musicians, the similarities between musicianship and medical skill, industrial music, acknowledged fame, and the idea of drinking coffee before sleeping in order to have fast dreams. In each of the segments of the film, the common motif of alternating black and white tiles can be seen in some fashion. The visual use of black and white relates to the theme of interpersonal contrasts, as each vignette features two people who disagree completely yet manage to sit amicably at the same table. Originally the 1989 short Coffee and Cigarettes, Memphis Version – aka Coffee and Cigarettes II – this segment features Joie Lee and Cinqué Lee as the titular twins and Steve Buscemi as the waiter who expounds on his theory on Elvis Presley's evil twin. Cinqué Lee also appears in "Jack Shows Meg his Tesla Coil". The scene also features a recounting of the urban legend that Elvis Presley made racist comments about Blacks during a magazine interview. Filmed in 1993 as the short Coffee and Cigarettes - Somewhere in California, and won the Short Film Palme d'Or at the Cannes Film Festival. In this segment musicians Iggy Pop and Tom Waits smoke cigarettes to celebrate that they quit smoking, drink some coffee and make awkward conversation. Renée French (played by herself) drinks coffee while looking through a gun magazine. E. J. Rodríguez plays the waiter, who is eager to be of service. He initially approaches her to serve more coffee, to which she reacts by saying "I had the right color, right temperature, it was just right". After that, he comes back several times, hesitates, and leaves. He seems intent on striking a conversation with her. Finally, he asks for her phone number, to which she responds by staring him down until he meekly scuttles off. Alex Descas and Isaach De Bankolé are a couple of friends who meet and talk over some coffee and cigarettes. Alex has no problems, or so he answers to Isaach's repeated questioning. At the end of the scene, Alex takes out a pair of dice and rolls three sets of doubles. It could be assumed that Alex Descas has an excessive gambling problem but to him it is not a problem because of what he can roll. Notice he doesn't roll the dice in front of his friend. Cate Blanchett plays herself and a fictional and non-famous cousin named Shelly, whom she meets over some coffee in the lounge of a hotel. There is no smoking in the lounge, as the waiter informs Shelly (but not until Cate is gone). Shelly tells Cate about her boyfriend, Lee, who is in a band. She describes the music style as hard industrial, similar to the band Iggy describes. Cate tells Shelly she looks forward to meeting "Lou" someday. Features Jack and Meg White of the band The White Stripes having some coffee and cigarettes. They play themselves, although the scene seems to perpetuate the band's former pretense that they are indeed siblings. Jack shows Meg his Tesla coil that he says he built himself and waxes intellectual on the achievements of Nikola Tesla. In the beginning, Jack seems upset that Meg doesn't share his excitement, and it takes Meg some coaxing to get Jack to agree to show Meg his Tesla Coil. He introduces the line, "Nikola Tesla perceived the earth to be a conductor of acoustical resonance." Cinqué Lee plays a waiter in this segment. In the end, the coil breaks, and Meg and the Waiter offer suggestions as to why it might be broken. Finally Meg says something that Jack seems to agree to, and he leaves to "go home and check it out". Meg clinks her coffee cup to produce a ringing noise, pauses, says "Earth as a conductor of acoustical resonance" and clinks her coffee cup to produce the noise again; she looks pensively out into the distance before a cut to black. Early during the segment, "Down on the Street" by The Stooges is played in the background. British actors Alfred Molina and Steve Coogan have a conversation over some tea. (Coogan offers Molina a French cigarette, but Molina saves his for later.) Molina is a very enthusiastic fan of Coogan's, who contrarily is very uninterested at their meeting and barely manages to hide this. Molina excitedly shares with him research he came across, learning that they are distant cousins, and proposes a friendship or show business project to capitalize on this. Steve Coogan still remains evasive, lightening up only when an attractive female fan recognizes him. He later tries to make up excuses to keep from ever having to hear from Alfred Molina again, and then clumsily tries to reverse this when he overhears Molina get a call from good friend Spike Jonze. But it is too late and Molina, disappointed, leaves Coogan with the bill. Although the scene is set in LA, the segment was actually shot in Brooklyn at Galapagos, Williamsburg. Hip-hop artists (and cousins) GZA and RZA of the Wu-Tang Clan drink naturally caffeine-free herbal tea and have a conversation with the waiter, Bill Murray, about the dangers of caffeine and nicotine. During this conversation GZA makes a reference to how he would drink lots of coffee before going to bed so his dreams would "whip by" similar to the camera-shots at the Indy 500, very similar to the same reference that Steven Wright did in the first segment. Murray requests that GZA and RZA keep his identity secret, while GZA and RZA inform Murray about nontraditional methods to relieve his smoker's hack. William "Bill" Rice and Taylor Mead spend their coffee break having a nostalgic conversation, whilst Janet Baker singing "Ich bin der Welt abhanden gekommen" from Mahler's Rückert-Lieder appears from nowhere. William Rice repeats Jack White's line, "Nikola Tesla perceived the earth as a conductor of acoustical resonance." It is possible to interpret the relevance of this line to the constant recurrent themes throughout the seemingly unconnected segments. On review aggregator website Rotten Tomatoes, the film has a 65% 'fresh' approval rating based on 122 reviews, with an average rating of 6.3 out of 10. The site's critical consensus states: "Episodes vary in quality, but overall this talky film is quirkily engaging." On Metacritic, the film has received a weighted average score of 65 out of 100 based on 35 critics, indicating "generally favorable reviews". ↑ "Coffee and Cigarettes". Box Office Mojo. Retrieved October 16, 2015. ↑ Caro, Mark (May 28, 2004). "With 'Coffee,' Jim Jarmusch lacks for rush". Chicago Tribune. Retrieved May 10, 2009. But then 1992's "Somewhere in California," which won the Cannes Film Festival's short-film Palme D'Or, offers the delicious spectacle of [Iggy Pop] and [Tom Waits] meeting in some remote dumpy bar, with Iggy playing the shaggy, eager-to-please puppy while the edgy Waits finds ways to take constant umbrage. ↑ "Coffee and Cigarettes". Rotten Tomatoes. Flixster. Retrieved October 16, 2014. ↑ "Coffee and Cigarettes Reviews". Metacritic. Retrieved October 16, 2015.